Rep. DeFazio speaking following the receipt of the AAR and GoRail’s Railroad Achievement Award. U.S. Rep. Peter DeFazio (D-Ore.) was honored Aug. 14 with the Railroad Achievement Award by the Association of American Railroads (AAR) and GoRail. 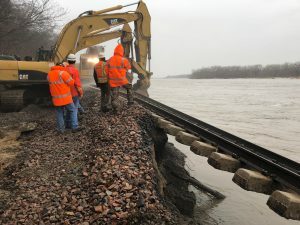 AAR says the award is given periodically to members of Congress who have shown leadership on policies that help ensure the vitality of railroads in the United States. 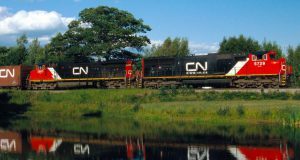 The Railroad Achievement Award was launched in May 2017 with Sens. John Thune (R-S.D.) and Bill Nelson (D-FL) jointly recognized as the inaugural award recipients. 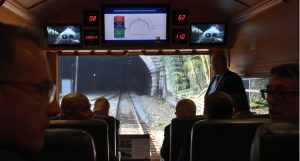 The organizers explain that award winners, such as Rep. DeFazio, have particularly shown an understanding of the distinct role railroads play in the American economy and the need for safe and efficient operations made possible through sustained investment. 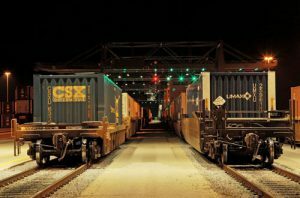 Rep. DeFazio is the Ranking Member of the House Transportation & Infrastructure Committee, a position AAR President and CEO Edward R. Hamberger says allows him to understand the critical role railroads play in the nation’s economy. Rep. DeFazio is also credited with many state-level rail accomplishments, such as helping secure a grant for the Oregon International Port of Coos Bay to purchase an abandoned rail line, as well as additional funding to rehabilitate the line. His work with the Coos Bay Rail Link earned him a locomotive named in his honor. In prepared remarks introducing Rep. DeFazio, GoRail’s Nate Kaplan discussed the critical safety enhancements made possible through the FAST Act. 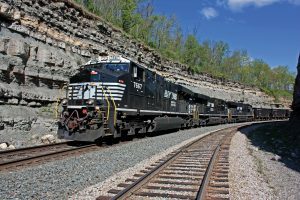 Kaplan also pointed to the reauthorization of the Surface Transportation Board (STB) in 2015 and applauded the broad representation of the rail sector at the event, including western rail carriers BNSF Railway and Union Pacific, shortline Genesee & Wyoming, Oregon-based rail suppliers and the host, of Willamette Valley Company (WVCO), a major local employer and international transportation supply and technology company. 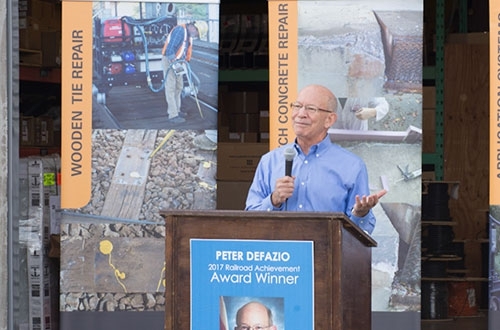 Rep. DeFazio accepted the award at WVCO’s manufacturing facility and the event was coordinated by the Railway Engineering-Maintenance Suppliers Association (REMSA).